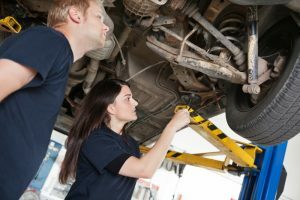 These days, the roads are full of hazards like potholes and speedbumps that can throw off your vehicle’s wheel alignment. Hitting a surprise pothole or curb can directly affect the alignment of your wheels, and can lead to a number of costly maintenance problems. If you’re looking for a local service technician in Loveland to do an alignment test on your car, contact the European car specialists at SRC Performance today. When your vehicle’s wheels are not properly aligned, it means they are not working together harmoniously. This can cause your engine to work even harder and use more energy, reducing overall fuel efficiency. Wheel alignment can significantly help you have more control over your car. Have you ever noticed your car drifting to the right or left side of the road, even though your steering wheel is centered? If so, it’s probably time to get your alignment checked. If you have to frequently adjust your steering wheel to make up for your car’s uneven alignment, bring it to our professionals at SRC Performance in Loveland for a complete and thorough diagnosis. When a car has bad alignment, it can cause other parts of the vehicle to wear unevenly and cause damage beyond wheel alignment. As you drive on various road types, different parts of your car’s steering and suspension systems will endure harsh and unnecessary impact, putting excess stress on them. This can cause other parts of your car to break down faster, and can cost a pretty penny in repair services. If your vehicle’s wheels are not properly aligned, the life of your tires could be at risk. Proper alignment will help extend the life and health of your tires, so you don’t have to worry about buying a new set. By properly keeping up with your car’s wheel alignment, you can greatly reduce the risk of a breakdown among other costly repairs. By taking preventative maintenance steps, your car’s ride will be smoother, and your passengers will be safer. If you have questions or concerns regarding your vehicle’s alignment, tire services, or wheel repair, contact the auto experts at SCR Performance today. Our professionals offer the latest in laser alignment machines, with unrivaled accuracy and vehicle control. Since 2004, we’ve provided specialized maintenance in European marques such as Audi, BMW, MINI, Porsche and Volkswagon, bringing high-quality auto parts, service, and knowledge to the Colorado European Car community.